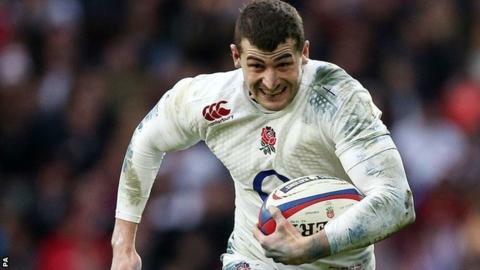 England winger Jonny May has been ruled out of the rest of the season. May suffered a knee injury while playing for Gloucester in last month's Premiership draw with Harlequins. The 25-year-old England's first-choice left wing at the World Cup and has won 19 international caps so far, but will now miss the Six Nations. "Following an operation on his left knee on Tuesday, Jonny May will be ruled out of the remainder of the campaign," said a club statement. Gloucester director of rugby David Humphreys described the injury as "significant" but refused to disclose exact details of what May had suffered. "He had surgery on Tuesday, the operation went well," Humphreys told BBC Radio Gloucestershire. "It's very difficult to put a timeline on any knee injury. It's a disappointing end to the 12 months for Jonny, both at club and international level." May's absence is a further blow for new England head coach Eddie Jones, with Bath forward Dave Attwood and Leicester lock Ed Slater ruled out of next month's championship earlier this week. Northampton prop Kieran Brookes is also set for an extended spell on the sidelines after having an operation on his knee, as is Exeter centre Henry Slade and back row Dave Ewers. England start their Six Nations campaign under Jones against Scotland on 6 February. Anthony Watson and Jack Nowell featured in the World Cup and may be the likely starters at Murrayfield, while Chris Ashton and Semesa Rokoduguni are pushing for places in the squad. Humphreys hopes to have May back for the start of next season, with the winger likely to also miss England's summer tour of Australia. "He was very quick to text me after the operation to tell me he plans to come back fitter and stronger," added Humphreys. "Jonny has shown in the past when he has been injured that he will work hard and I have no doubt we will see him back performing and shining in Gloucester colours."